This cemetery in the Somme is a mile southwest of the village of Mailly-Maillet and 5 miles north of Albert on the D919. It had been started by the 2nd Seaforths in June 1916 and used by the 51st (Highland) Division November 1916, and 12th and 21st Divisions in May and August 1918. There are 624 British, 27 New Zealand, 3 South African and 41 unidentified burials and 8 special memorials. For most conspicuous bravery and initiative when in command of a platoon in support of forward platoons which had been ordered to hold on at all costs. When the enemy counter-attacked in force, he rushed forward on his own initiative to help the forward line, rallying and controlling the men holding it. The enemy by this time were advancing quickly, and had already obtained a footing in the trench. Serjt. Colley then formed a defensive flank and held it. Out of the two platoons only three men remained unwounded, and he himself was dangerously wounded. It was entirely due to Serjt. Colley's action that the enemy were prevented from breaking through, and were eventually driven off. His courage and tenacity saved a very critical situation. The grave of Major Herbert Geoffrey Lush-Wilson of the Royal Horse Artillery. Whilst serving in Y Battery he fought at Gallipoli with the 29th Division and he and his battery came to France with that division in April 1916. 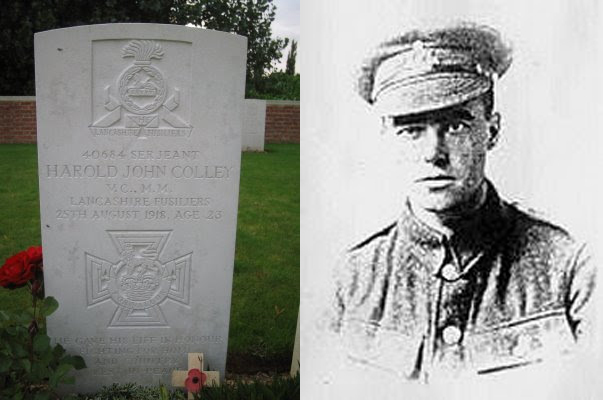 He was awarded the Chevalier of the Legion of Honour and was killed near Mailly by counter-battery fire on July 21, 1916. 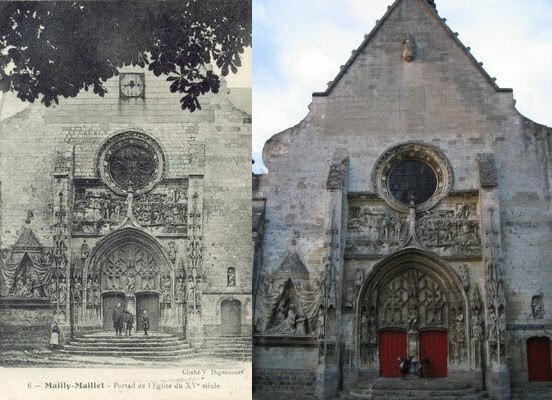 The church of Saint Pierre in Mailly Maillet dates from the 15th century and managed to survive the Great War. after the pastor protected the mediaeval west doorway with sandbags. A rare WW1 German feldpostkarte I ran upon showing the shell damaged-church and village, with trench lines to the rear - most probably the Waggon Road sector. There is also a cross in the foreground - possibly the grave of a German soldier. The picture shows the village before it was destroyed in the bombardment later in the year, the trees still have leaves, and many structures still standing. Also the hillside to the rear is free from shellholes. 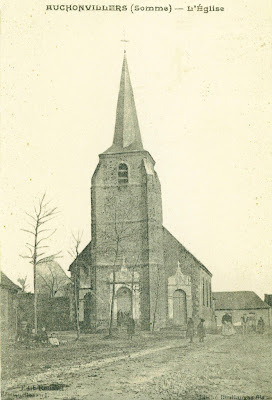 The postcard has been postally used - in February 1916 by a German soldier, who gives his unit details which indicates that he was part of the 119 Reserve Infanterie Regiment. There is also a unit stamp, which indicates further that he was part of the 11th Company. 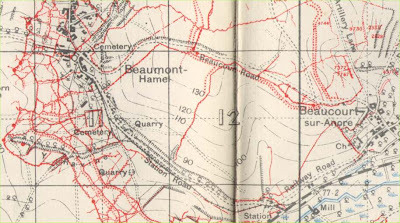 The 119 Reserve Infanterie Regiment held the sector around Beaumont Hamel in 1916. There is also a feldpost stamp from the 26th Reserve Division dated 20 Feb 16. 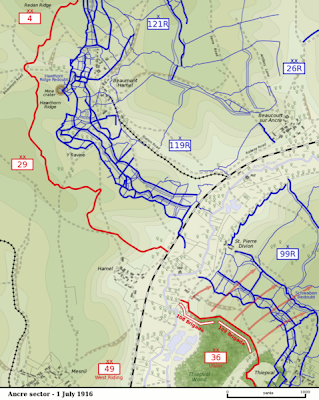 This division held part of the Somme front from 1914 to 1916. Colincamps is a village about 16 kilometres north of Albert. Sucrerie Military Cemetery is about 3 kilometres south-east of the village on the north side of the road from Mailly-Maillet to Puisieux. It was initially established by the French in the early summer of 1915, and extended to the West by British units from July in that year until, with intervals, December, 1918. It was called at first the 10th Brigade Cemetery. Until the German retreat in March, 1917, it was rather more than a 1.6 kilometres from the front line; and from the end of March, 1918, (when the New Zealand Division was engaged in fighting at the Sucrerie) to the following August it was under fire. 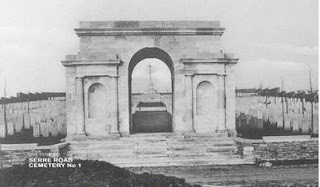 After the 285 French and twelve German graves were removed after the Armistice leaving gaps in the lettering of the Rows, there are now 1104, Great War dead commemorated here of whom 219 casualties are still unidentified. 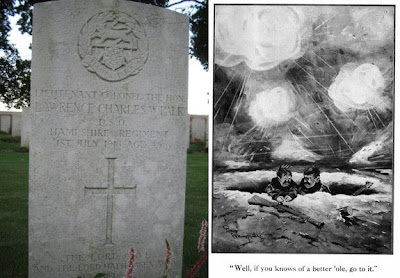 The grave of Lieutenant Colonel the Honourable Lawrence Charles Palk, DSO. He was born on 28 September 1870. He fought in the Boer War between 1901 and 1902. He gained the rank of Major and Temporary Lieutenant-Colonel in the service of the Hampshire Regiment. He fought in the First World War, where he was mentioned in despatches and was decorated with the award of Legion of Honour. He was decorated with the award of Companion, Distinguished Service Order (D.S.O.). He died on 1 July 1916 at age 45, killed in action serving as commanding officer of the 1st Hampshires which lost all 26 of their officers and 559 of their men on that day. According to Major Holt (p.91), he exhorted his men that it was the greatest day the British army ever had, dressed himself in his finest uniform and donned white gloves before leading his battalion across No Man's Land. "Lying mortally wounded in a shell hole, he turned to another man lying near him and said "If you know of a better 'ole, go to it." Waiting for the sun to go down in this quiet plot. 1,293 are buried here, of whom 1123 are identified. Someone attached this photo to put a face to this stone for a soldier far from home. The grave of the poet Sgt. John William Streets, York & Lancs. Killed opening day of the Somme. That lives out there beneath the Battle's Roll"
Auchonvillers is about six miles north of Albert and ten miles west of Bapaume. It was christened 'Ocean Villas' by Tommies. Auchonvillers Communal Cemetery is to the south-east of the village, on the road to Hamel. In the cemetery is this single row of fifteen graves, all with the same kind of sandstone which is rather unique. Thirteen of these Non-Commissioned men of the 1sr Border Regiment were killed at the same time by shellfire, when the Germans bombarded the communication trench they were in in April, 1916. One of the inscriptions is of a tribute from a wife: "I knew his worth, I loved him" From Auchonvillers to the Newfoundland Memorial Park one passes a trio of small cemeteries named after a group of British front-line trenches of 1916. The cemeteries were made by the V Corps in the spring of 1917, when these battlefields were cleared. They had been among the old German front line trenches. The fighting here in 1916 has long been overshadowed by events on each flank, namely Serre on the left and Beaumont Hamel on the right. On 1 July 1916 the sector was occupied by the 4th Division, made up of some of the veteran regular battalions, the 'Old Contemptibles', although few of the original members had survived thus far. It was mainly Territorials and' new army' men who fought here. A special feature includes little known accounts of events at the Quadrilateral on that fateful day. The November battles involve the 2nd Division and the 32nd Division and include the struggle across the mud to Beaumont trench, Frankfurt and Munich trenches. Biographical details of some of the famous men who took part, such as H H Munroe, the author 'Saki' and A A Milne, creator and author of Winnie the Pooh, are also included. The clump of trees beside Redan Ridge CWGC #1 mark the site of the Hawthorn Ridge crater. There are over 250 graves in Redan Ridge #2, and almost all the headstones have two or more names with different badges engraved to represent the different regiments. One stone in row B has just a cross on alone, probably because the number of names on the surrounding stones did not allow for a religious symbol on each headstone. Just over 150 of those buried here are identified, and the cemetery is one of those which was made by V Corps in the spring of 1917. Like others, it is located in what was No Mans Land during the summer of 1916. Too small to have a registry, Redan Ridge #3 lies just behind the 1916 German front line trenches here. To the left and right of the entrance are thirteen special memorials to men known to be buried here. Their graves were destroyed later by shellfire. With one exception, the known burials here date from mid-November 1916, with many from the 13th November when there were successful attacks near here. White City Beaumont Hamel in July of 1916. During the war, Beaumont-Hamel was near the front line and subject to many attacks. This was especially the case during the Battle of the Somme, one of the largest allied offensives of the war. By 1918 the village had been almost totally destroyed. 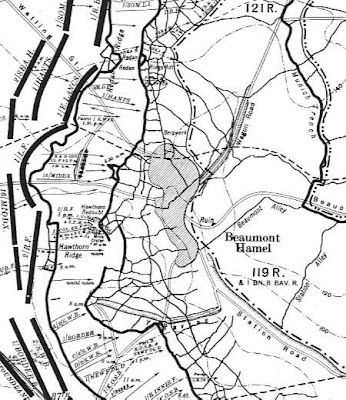 The banks of white chalk at Beaumont Hamel led to a sector of British trenches being nicknamed "White City". To the west of the village was Hawthorn Ridge Redoubt, one of the sites of the mines exploded on the first day of the Battle of the Somme. On 1 July 1916, nearly 700 men of the Newfoundland Regiment (later to become the Royal Newfoundland Regiment) were killed or injured by German fire as they moved over open ground to make an attack, the communication trenches being already full of wounded men. Newfoundland commemorates this event as Memorial Day on 1 July each year. With 113 graves, the majority of the men buried here are soldiers who fell on 1st July 1916, with some from 13th November. The Newfoundland Regiment attacked here on the 1st of July 1916, and suffered 90% casualties. 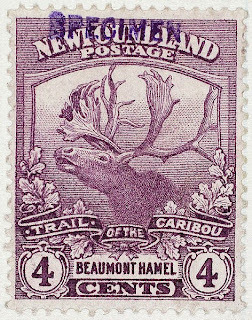 The Dominion of Newfoundland purchased this land in 1921, and after 1949 the Canadian government continued to maintain it as a memorial. It was officially opened in 1925, by Earl Haig. The Caribou was used as it was the symbol of the Royal Newfoundland Regiment and is found on all Newfoundland graves. The so-called Danger Tree found half-way across No Mans Land which probably marks about the limit of any Newfoundlanders' advance that day. A strange Canadian flag joins those of Newfoundland (both countries of which would have fought under the Union Flag not flying despite the considerable British lying dead inside the park) and France. The Newfoundland and Labrador branch of the Royal Canadian Legion to this day does not recognise the current Newfoundland flag as the flag of Newfoundland arguing correctly that during both world wars, Newfoundland soldiers fought under the Union Flag of the Dominion. The legion displays the Union Flag at all of its official functions. 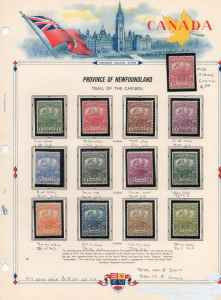 In 1919 the Dominion of Newfoundland produced a series of stamps honouring the various campaigns the Regiment took part in. This one honours Beaumont Hamel. 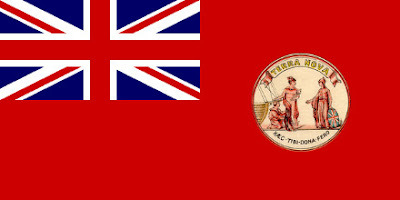 The full set was later released when Newfoundland joined Canadian Confederation, hence the Canadian red ensign, badge and Parliament depicted. This impressive memorial bears the statue of a kilted Highland soldier, looking east towards the village of Beaumont Hamel which men of the 51st Division took on 13th November 1916. The base upon which he stands is made of rough blocks of Rubislaw granite from Aberdeen, and it has inscriptions in Gaelic, English and French. Marshal Foch officially unveiled it in September 1924 and concluded his speech with the words "Sons of Scotland, sleep in peace". In World War Two the Germans had intended to remove the statue for the bronze, but never did. Directly across from the memorial is this one which reads "This Cross is erected in memory of the Officers, NCOs and men of the 51st Highland Division who fell at High Wood July 1916". Y Ravine cemetery is inside the Newfoundland Beaumont-Hamel Memorial Park and has 366 graves of those killed during the Somme Offensive between July and November 1916. The graves of the 38 Newfoundlanders here are engraved with the badge of their regiment showing the woodland caribou. This beautiful cemetery nearby the 51st Highland Division Memorial is unique in that the headstones do not stand as grave markers, but are set into a central wall. The 46 dead here of the 51st Division who fell during capture of Beaumont Hamel and buried here in a great shell-hole. The name may refer to Reverend Hunter, attached to the Black Watch. "Sleep well dear Dad, you did your best"
Aerial view of the area with the names of various trenches that would subsequently give their names to many of the Commonwealth War Grave Cemeteries here. This memorial in the village of Serre was erected by the city of Sheffield on May 21, 1923 by Lieutenant-Colonel Wedgwood to the men of the City Battalion who were killed on the 1st of July 1916. On the D919 west of Serre is Serre Road No. 1 Cemetery. The road here had been originally crossed by German front line trenches in 1916. Serre was not the place to be in 1914-18 and lest we had any doubts of this the approach to the village sees Serre Road Cemetery No.2 on the left and Serre Road Cemetery No.1 on the right but not before we see the mass of graves in the French Serre-Hébuterne Cemetery. No sooner have we absorbed this do we come across a rather forlorn little memorial to the York and Lancasters. In 1916 Serre was to be hell for the British and Allied Armies, but the French had already seen many deaths there in the actions of 1915. In the village of Serre itself is the memorial to the 31st Division which consisted of Pals’ battalions drawn from Leeds, Bradford, Barnsley, Sheffield, Durham and Accrington. 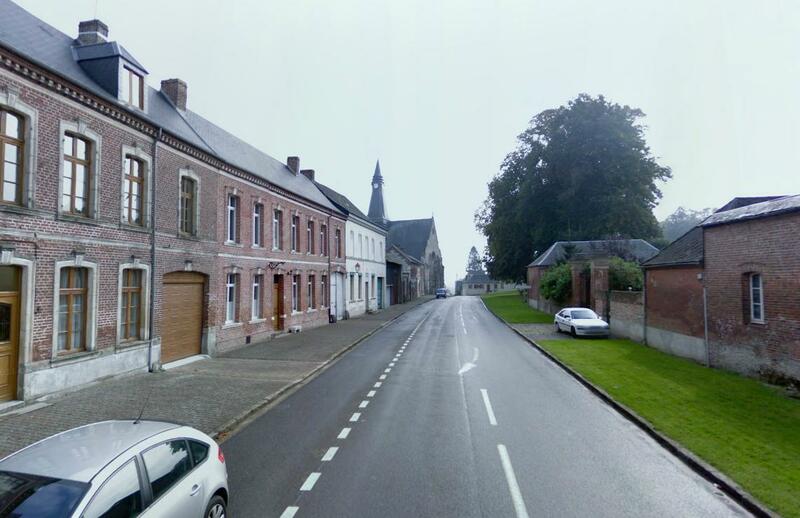 The 31st Division were charged with taking the village and when they "went over the top" they were soon to lose over 5,000 men. Nearby is Hawthorne Ridge where a 45,000 ammonal mine was blown on 1 July 1916, one of the many detonations before the attack started which it was hoped would distract the Germans. The Accrington Pals, officially the 11th Battalion East Lancashire Regiment, were part of the 31st Division. They had served in Egypt in 1915/16, and then came to the Somme in the Spring of 1916 taking over the trenches opposite Serre. At 7.30am on 1 July 1916 they were in the first wave of the attack from Mark Copse, and although they suffered heavily crossing No Man's Land, elements of the battalion under the commanding officer, Lt-Col Rickman, did reach the German lines. By the close of the day, however, they were forced back and had lost 584 officers and men out of 720 who had made the attack that morning. The Memorial was erected in the 1980s in the Sheffield Memorial Park, just behind one of the jumping off trenches from where the Accrington Pals advanced on 1 July. It is made from Accrington brick, and the ruined wall symbolises the ruined village of Serre. The British 31st Division was a New Army division formed in April 1915 as part of the K4 Army Group and taken over by the War Office on 10 August 1915. The division comprised mainly battalions from Yorkshire and Lancashire. There are now 2,426 buried or commemorated in this cemetery of which 1,728 remain unidentified. Thy will Lord but not mine. Mother This imposing cemetery stands today where No Man's Land was between the German and British lines during 1916, which a sign further down the road confirms. Over 7, 000 lie buried here, with almost 5, 000 of them unidentified- the largest number of unidentified burials in France. Just outside the cemetery is this private memorial to Valentine Ashworth Braithwaite, who was a Lieutenant in the 1st Somerset Light Infantry, dying July 2, 1916. This marker commemorates the site where the bodies of three soldiers (two German and one unknown British) were found in October 2003. The two Germans were from the 121 RIR and had who died June 1915 while the British soldier is believed to have died on the 1st of July 1916; only his regiment, the King's Own (Royal Lancasters) could be identified. The regimental badges of the two units are on either side of the memorial, unveiled June 2006. The British soldier is now at rest at nearby Serre Road No. 2 Cemetery. "O sir, my eyes - I'm blind - I'm blind, I'm blind!"